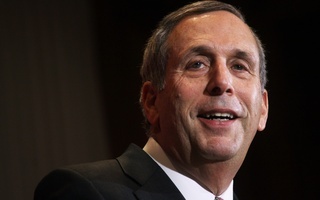 As first-year students struggled under the weight of Bed, Bath, and Beyond boxes during move-in last week, newly-minted University President Lawrence S. Bacow didn’t stand idly by. Leigh Sharpless ’22 said she was pleasantly surprised when Harvard’s newest leader “swooped in” to help her father carry her boxes into Weld Hall. Sharpless’s father was in the process of lugging two boxes to Weld and was “obviously struggling,” Sharpless said. “Like the hero he’s made out to be, [Bacow] offered a hand to my dad to help carry a box, and it was really great and it was just at the right time, too,” she said. Two months into his presidency — and days into his first semester — Bacow is taking an active, and very visible, role in undergraduate life. University presidents often spend time huddling with top administrators, talking strategy with higher education leaders, lobbying politicians, and exchanging pleasantries with foreign dignitaries. Bacow has already made a point of including box-lugging and trading stories with undergraduates in the repertoire. 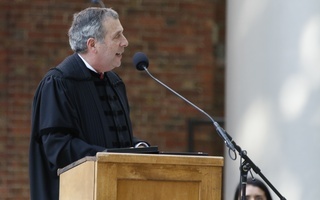 Bacow wrote in an emailed statement that he and his wife, Adele, “enjoyed” the experience of their first move-in day at the College, which occurred just a month after Bacow moved into his new office with the start of his tenure. “It was inspiring meeting students and their families from all over the U.S. and the world. We loved seeing the excitement on students' faces and the pride in their parents’ hearts,” Bacow said. Harvard documented Bacow’s presence in the Yard on its Instagram (@harvard), where Bacow and his wife were pictured wearing official “Move-In Day Staff” shirts with first-year students. Bacow and Adele took a selfie with two international students — Robert Kossmann ’22 and Luke Walker ’22 — that appeared on the account, along with several photos of move-in day events. Kossmann added that he expected that Bacow “would not have much time,” but that the two had a “pretty cool” conversation about Bacow’s parents’ immigrant background, which resonated with Kossmann, an international student from Germany. Besides heavy-lifting in the Yard, Bacow also visited the inaugural group of First-Year Retreat and Experience participants. FYRE leader Daniel Rodriguez ’20 said Bacow helped to quell common fears among first-generation students and encouraged students to find a community at Harvard that will support them. 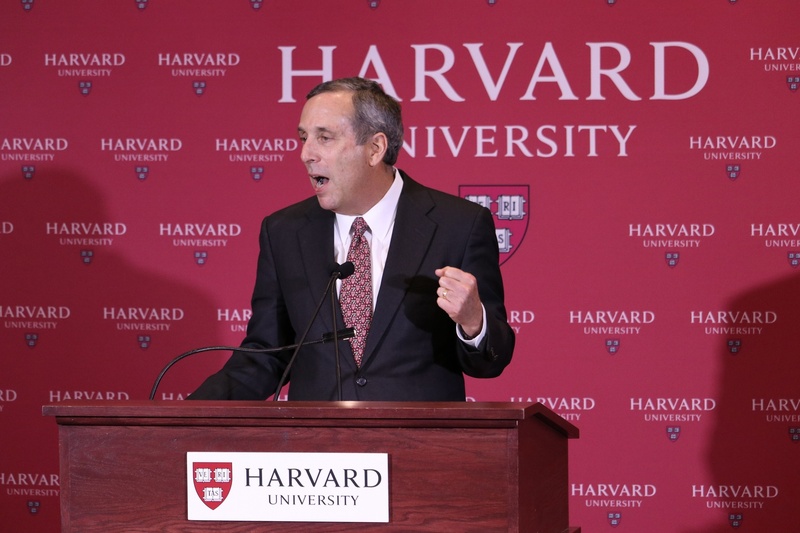 “Having somebody at the forefront of Harvard and leading this college come in and talk to the students, show that they actually belong here and actually have a place to be here was really helpful,” Rodriguez said. 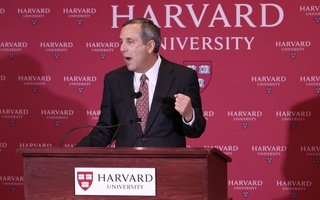 Bacow, who previously helmed Tufts for 10 years, was known at the school for his involvement in undergraduate life — a reputation he appears to be recreating at Harvard. When Bacow was selected as the University President last February, Kirkland House administrator Kate D. Cavell — who had been an undergraduate at Tufts — dubbed him a “champion of undergraduates.” Bacow, an avid runner, was known for going on runs with Tufts students, a tradition he continued during Opening Days — he hosted a mid-run stop at Elmwood, the presidential residence, for a group of freshmen runners. At Tufts, he invited students to his house and made a point of personally responding to every email he received, according to Tufts’s website. 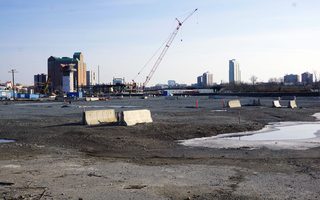 A previous version of this article misstated the name of Kirkland House administrator Kate D. Cavell. It has been updated.